LAKE ODESSA, Mich. - June 5, 2016 - Pesky and persistent weather did not put a damper on David Gravel's night, as he led all 17 laps and scored his third World of Outlaws Craftsman® Sprint Car Series victory of the season in a rain shortened Rumble in Michigan at I-96 Speedway on Sunday night. Gravel continued his streak of winning the dash and leading the most laps in the feature after doing so on Friday night at Fremont (Ohio) Speedway. "Crazy weekend here - getting rained out and having a rough track tonight," Gravel said. I saw the rain flying there during that red flag, so it's pretty cool that they called it early. I'll take any win I can get - it still pays the same and counts the same, so we will take it." Gravel's victory was not easy, as he had to hold off Shane Stewart, who charged from a sixth starting position to the leader's back bumper before the rain moved in. "I had a good car, and I felt like we had a chance if we could get to [David] Gravel in lapped traffic," Stewart said. "Obviously, when you get to lapped traffic, it's about navigating through and hitting the ruts just right. "There was a couple of times [Gravel] bounced around a little bit and I was able to close up on him, but we never got the chance to really go after it." Action on Sunday started a dim forecast as thick, dark clouds blanketed the sky early in the afternoon. Fortunately, before cars even hit the track, the clouds cleared and allowed rare rays of sunshine to break through and create a picturesque day. The sunshine, coupled with an extremely fast track, allowed eventual third-place finisher finisher, Brad Sweet, in the Ollie's Bargain Outlet/Sage Fruit, to set a new track record with a time of 13.585 seconds, eclipsing Jason Sides' record of 13.746 seconds from 2015. "Our car was really fast tonight," Sweet said. "You can't control Mother Nature, and we're disappointed we couldn't get it in, but it was still a good night for us finishing on the podium and bringing the car home in one piece." Of the three heat races, Outlaw drivers swept two of them, while All Start Circuit of Champions driver, Kraig Kinser, won the third. The heat finishes created a split of four Outlaw drivers versus two non-Outlaws in the dash. An inversion draw of six placed non-Outlaw driver, and Warrnambool, Victoria, Australia -native, James McFadden, on the pole for the six-lap race. Eventual winner, Gravel, in the Big Game Treestands/JRC No. 5, started on his outside and quickly took the lead on the start. Gravel's dominance of the dash placed him on the pole position for the 35-lap feature. Gravel took full advantage of the front-row starting position as he jumped out to an early lead when the green flag dropped. Only two caution flags slowed the rain-shortened feature, with the final coming on lap 17 just before the showers moved in. Ever-changing track conditions allowed drivers like Stewart, in the American Born Moonshine/Eneos Oil No. 2, and seven-time World of Outlaws champion Donny Schatz, who started in the tenth position, to charge to the front of the field. As the race progressed, Stewart managed to work his way to the second position, as the leader battled through lapped traffic. Stewart closed on Gravel just as the final caution flew on lap 17, but never had the chance to challenge for the lead. "It was getting to be a good race," Stewart added. "Obviously, we can't help Mother Nature had a different plan for us. I am happy they made it official - it was a great point night for us - we had a mishap in the dash and were able to come back and finish on the podium." 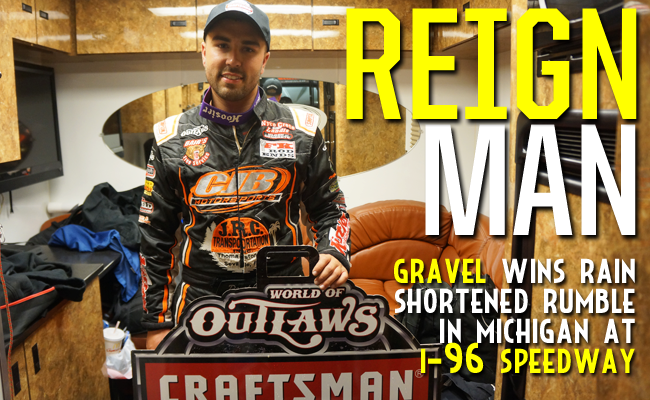 Gravel was able to control the top position for the entire feature, as he held off Stewart until the rain started to fall and secured the $10,000 to-win checkered flag at I-96 Speedway. "Everybody that supports this team, thank you very much," Gravel said. "It's just a dream come true to get our third win of the season, and hopefully there's more to come. We have been very good over the last couple of weeks, so hopefully we keep it going." Sweet, who has seen his point lead disappear in recent weeks, captured his best finish since New Egypt on May 24, and padded his championship lead on Schatz, who finished fourth. "We were able to figure some things out tonight," Sweet added. "We will go back to work this week and try to build on our run tonight and get ready for Lincoln Park Speedway on Wednesday." The World of Outlaws Craftsman Sprint Car Series travels to the Hoosier State for the final time this season when the series invades Lincoln Park Speedway in Putnamville, Ind. on Wednesday, June 8. For more race information and ticket purchasing options, visit: www.WoOSprint.com/Lincoln-Park-Speedway. RACE NOTES: Brad Sweet set a new track record at 13.585 seconds, beating Jason Sides' record of 13.746 seconds set in 2015...David Gravel won the dash and led the most laps in the second consecutive race in-a-row...Kevin Gobrecht Rookie of the Year contender, Clyde Knipp, qualified for his second feature of 2016. CONTINGENCY WINNERS - MSD Ignitions ($25 cash): Clyde Knipp; MSD Ignitions ($50 cash): David Gravel; Penske Shocks ($50 cash): Donny Schatz; JE Pistons ($50 cash): Jason Sides; VP Racing Fuels ($50 cash): Chad Kemenah; Edelbrock ($50 cash): Daryn Pittman; Comp Cams ($50 cash): Kerry Madsen; Morton Buildings ($50 cash): Kraig Kinser; Cometic Gasket ($50 cash): Paul McMahan; Super Flow ($50 cash): Logan Schuchart; Craftsman/Sears ($100 cash): James McFadden; KSE Racing Products ($100 product certificate): Chad Kemenah; Comp Cams ($50 product certificate): David Gravel; JE Pistons (Set of Rings): Jacob Allen; JE Pistons (Set of Rings): Clyde Knipp. SEASON WINNERS: Donny Schatz - 7 (Volusia Speedway Park on Feb. 14, The Dirt Track at Las Vegas on March 4, Stockton Dirt Track on March 18, Stockton Dirt Track on March 19, Silver Dollar Speedway on April 2, Lincoln Speedway on May 19, Weedsport Speedway on May 22); Brad Sweet - 6 (Volusia Speedway Park on Feb. 13, Volusia Speedway Park on Feb. 14, Cotton Bowl Speedway on Feb. 26, Ocean Speedway on April 1, Bakersfield Speedway on April 15, Plymouth Speedway on May 13); Daryn Pittman - 4 (Royal Purple Raceway on Feb. 27, Perris Auto Speedway on April 16, USA Raceway on April 18, New Egypt Speedway on May 24); David Gravel - 3 (Thunderbowl Raceway on March 12, Tri-State Speedway on May 14, I-96 Speedway on June 6);Joey Saldana - 3 (The Dirt Track at Las Vegas on March 3, Devil's Bowl Speedway on April 22, Jacksonville Speedway on May 4);Shane Stewart - 3 (Arizona Speedway on March 6, Devil's Bowl Speedway on April 23, Lawrenceburg Speedway on May 30);Kerry Madsen - 2 (Eldora Speedway on May 6 and 7); Lance Dewease - 1 (Williams Grove Speedway on May 20);Chad Kemenah - 1 (Fremont Speedway on June 3); Jason Johnson - 1 (Placerville Speedway on March 24); Jason Sides - 1 (I-30 Speedway on April 26); Greg Wilson - 1 (The Dirt Track at Charlotte on May 27). World of Outlaws Craftsman® Sprint Car Series Statistical Report; I-96 Speedway; Lake Odessa, Mich.; June 5, 2016. Last Chance Showdown - (12 Laps - Top 6 finishers transfer to the A-feature) - 1. 21-Cap Henry [3[-]; 2. 11R-Chase Ridenour [-]; 3. 38-Max Stambaugh [-]; 4. W20-Greg Wilson [-]; 5. 13-Clyde Knipp [-]; 6. 27K-Ben Rutan [-]; 7. 71H-Brad Lamberson [$200]; 8. 27Z-Sean Zemunik [$200]; 9. 7J-Joe Swanson [$200]; 10. 19-Brett Mann [$200].